Pema Chodron teaches that in order to feel compassion for other people, we have to feel compassion for ourselves. In particular, to care about people who are fearful, angry, jealous, overpowered by addictions of all kinds, arrogant, proud, miserly, selfish, mean, you name it – to have compassion and to care for these people means not to run from the pain of finding these things in ourselves. – Mathew Fox in One River Many Wells. How true is that. I’m not sure about you but I know that there are times when I am amazed at how little I feel for myself or am in touch with exactly how I feel. Sure, I’ve done pity parties before but this isn’t about asking for sympathy – even if it is from yourself, which are what pity parties are about…well okay, it’s the gala dinner for feeling sorry for yourself. When I read that I realized something. I’ve grown up feeling quite numb for myself and because of this I don’t feel so much for others too. I’ll be honest and say that sometimes I find that I can say all the “right” things when the situation calls for it but I know that my number 1 battle right now is to truly feel – feel for others…and before that I guess for myself . That’s what I mean when I say that I want to…need to open my heart. It had been closed up for so long that trying to get the door open has been (and still is) an upward battle. One way that I’m learning to use is to consciously tell (more like berate) myself when I feel that I’m being unreasonable or impatient with another. When my assumptions are skewing the situation to something that it is not, I try my best not to “scold” myself or judge it but instead (again consciously) tell myself that it’s good that I am becoming more aware and that it’s okay to feel whatever I feel, that it’s okay to make mistakes…that I managed to catch it in time. Compassion allows you to decide that you are going to buy a meal for the homeless man just as it allows you to forgive yourself for yelling at your spouse the last evening. It means that you buy the meal for the homeless man and then let it go with no feelings of pity for him as you would apologize to your spouse and let it go without berating yourself over it. 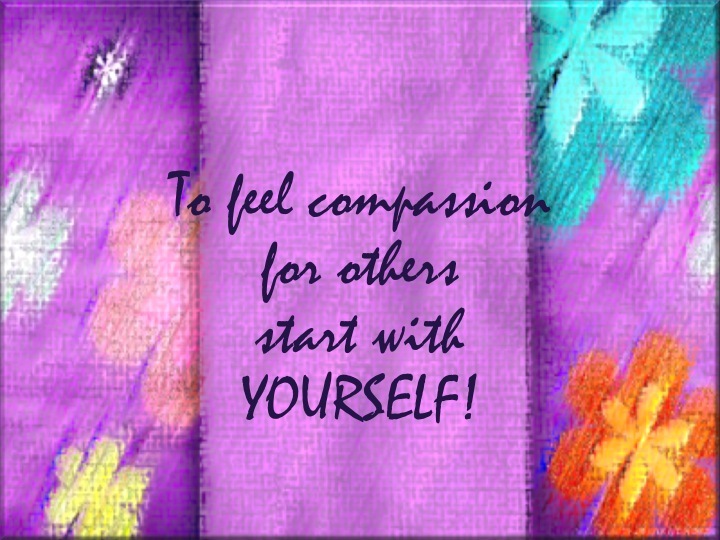 Just as compassion to ourselves does not mean having self-pity, it also means that compassion for others does not have pity attached to it. There is no “poor Mr X” just like there shouldn’t be a “Poor little me”. Pity degrades and brings us down. I should know! Throwing pity parties can be energy depleting! The sad thing though is that it’s something that we need to actually put effort into…being compassionate and loving to ourselves when it’s supposed to be a natural thing to do. It’s sad that society has deemed it not right behaviour to love yourself first, to allow the word “selfish” which means taking care of yourself first as something bad, when it’s not. True that Anyes! 🙂 It’s something that I feel most of us need to learn to do though because we have been taught, in some form or the other that it is not okay to do so.